This story has been sitting in my inbox for some time, but here is an excellent report that describes it all well. A scientific assumption that has survived for perhaps a couple of centuries has just been shown false. That is how important this item is. We now need to properly map the solar wind for the next few decades to determine what correlations exist if any at all. And we also need to stamp all published research on sunspots and solar energy as pre 2009. It is also exciting. We have discovered a significant variable that was assumed fairly stable or at least tied to an eleven year cycle to now be highly variable over much shorter time ranges. It may be actually linked directly to global weather effects. Of course we will need to monitor the variation closely for a long time before we know anything but it is today a surprise to science and will cause all the text books to be rewritten even now. 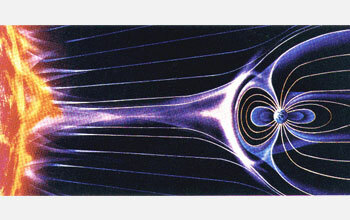 This artist's rendering shows the solar wind as it streaks by Earth. Challenging conventional wisdom, new research finds that the number of sunspots provides an incomplete measure of changes in the sun's impact on Earth over the course of the 11-year solar cycle. The study, led by scientists at the National Center for Atmospheric Research (NCAR) and the University of Michigan, finds that Earth was bombarded last year with high levels of solar energy at a time when the sun was in an unusually quiet phase and sunspots had virtually disappeared. "It is vitally important to realize that the 'quiet' sun really isn't all that quiet," says Rich Behnke, program director in NSF's Division of Atmospheric Sciences. "These high-speed streams of wind can affect many of our communications and navigation systems. And they can come at any time, during any part of the solar cycle." When those streams blow by Earth, they intensify the energy of the planet's outer radiation belt. This can create serious hazards for Earth-orbiting satellites and affect global communications systems, while also threatening astronauts in the International Space Station. Auroral storms light up the night sky repeatedly at high latitudes as the streams move past, driving mega-ampere electrical currents a few hundred miles above Earth's surface. All that energy heats and expands the upper atmosphere. This expansion pushes denser air higher, slowing down satellites and causing them to drop to lower altitudes. Scientists previously thought that the streams largely disappeared as the solar cycle reached minimum. But when the study team compared measurements within the current solar minimum interval, taken in 2008, with measurements of the last solar minimum in 1996, they found that the Earth in 2008 was continuing to resonate with the effects of the streams. Although the current solar minimum has fewer sunspots than any minimum in 75 years, the sun's effect on Earth's outer radiation belt, as measured by electron fluxes, was more than three times greater last year than in 1996. 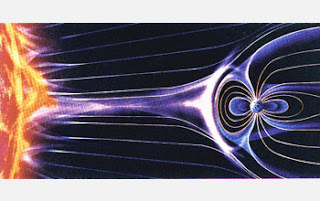 The prevalence of high-speed streams during this solar minimum appears to be related to the current structure of the sun. As sunspots became less common over the last few years, large coronal holes lingered in the surface of the sun near its equator. The high-speed streams that blow out of those holes engulfed Earth during 55 percent of the study period in 2008, compared to 31 percent of the study period in 1996. A single stream of charged particles can last for as long as seven to 10 days. At their peak, the accumulated impact of the streams during one year can inject as much energy into Earth's environment as massive eruptions from the sun's surface can during a year at the peak of a solar cycle, says co-author Janet Kozyra of the University of Michigan.